Throughout this summer, some of our members have been training and racing for amazing charities, raising money to support some great causes. You can read all about what they are taking on, how they are feeling and also the charities they have chosen to swim, bike or run for. 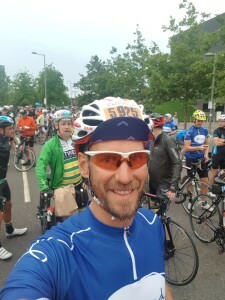 Some really inspiring stuff from people we are so proud to be part of our club and if you feel like reading more, the links to the donation pages are below with much more information and heart warming stories. Good luck to all of you and well done for what you are achieving in the name of philanthropy! Who are you supporting? Save the Children – they stand side by side with children in the toughest places to be a child. They do whatever it takes to make sure children survive, get protection when they’re in danger, and have the chance to learn. What inspired you? Growing up in Colombia, I was very lucky to be blessed with opportunities when growing as well as good health. It’s something that I want to give back to so many children who are suffering around the world today. What will you be most afraid of on the day? Most certainly the start of the swim with thousands of other people around. I have to focus a lot not to get distracted when pushed/pulled/ touched /kicked on the water!! 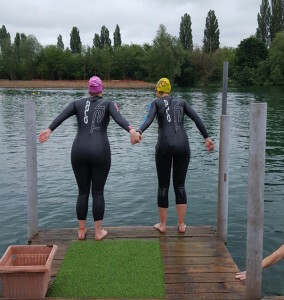 Basically I want to make sure I feel strong by the end of the swim…#facingfears. What will be the first thing you do after? As it’s my first race I’m pretty sure I’ll try to mentally absorb what just happened…most likely by eating a humongous meal! Who are you supporting? VICTA – supporting children and young people who are blind or partially sighted and their families across the UK. What inspired you? It’s charity very close to my heart, my other half has been blind in one eye since birth. Thankfully she has relatively god sight in her other eye but it is a constant reminder of how precious our vision is, being able to see and experience the world. 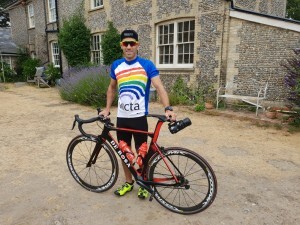 We both enjoy being able to participate in activities that help fulfil our lives and so I’m riding for VICTA to help support children who have not been as fortunate and give them the best chance of living the fullest life they can. What were you most afraid of on the day? It rained so much on the day. I was just wearing a summer jersey and by the time I finished I was shivering so much that a lady came to offer me a poncho, I had multiple cups of boiling tea and coffees to try and warm myself up. Now that the even is done, what are you doing? I am now on holiday somewhere much warmer! Read more about Francesco’s story here. What are you doing? A [somewhat intense] series of events throughout the summer to challenge myself! Who are you supporting? MIND – giving advice and support to empower anyone experiencing a mental health problem. They campaign to improve services, raise awareness and promote understanding. What inspired you? 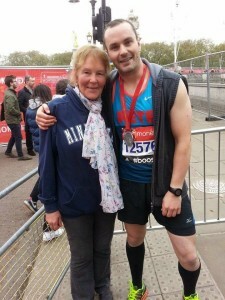 I did the Prudential 100 last year and enjoyed it so much that I wanted to do it this year but with a charity who I supported. 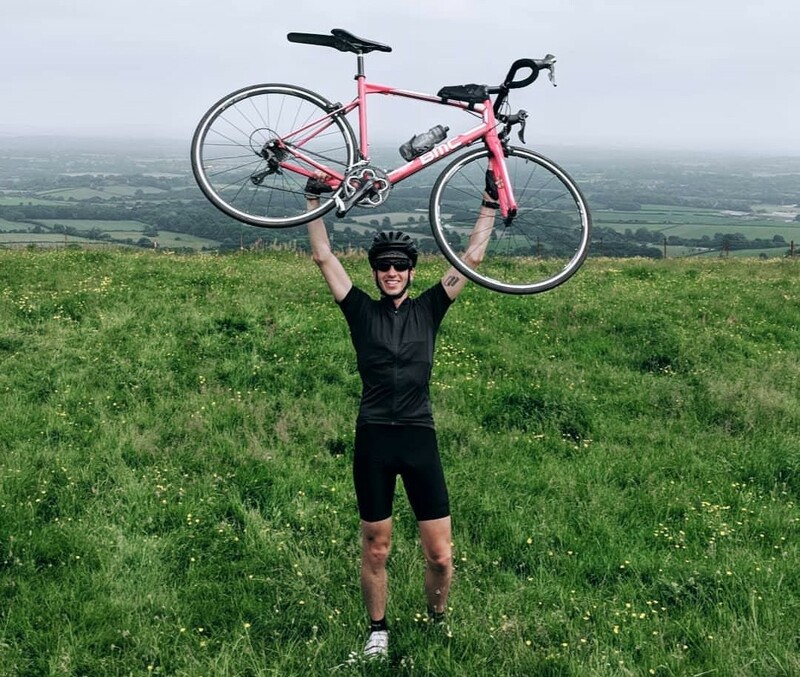 I didn’t think that just doing one event would be enough to push myself and so decided to string together a season of sportives and races as a larger challenge. We’ve all become much more aware over the past few years that mental health issues can affect anyone. I’ve had times when I’ve needed a bit of help myself and found the MIND website really useful. I can only begin to imagine what life must be like for someone with a serious mental health problem. Sport and triathlon plays a big part in keeping me well both mentally and physically. In fact, given the amount that I crash it probably keeps me in better mental shape than physical! What are you most afraid of in your events? Hills…. What is the first thing you do after? Eat fish and chips. My guilty pleasure. I’m really good at resisting them on a weekly basis, but that’s what I eat post-race. Preferably with a nice big tub of curry sauce. Read more about Rory’s story here. Who are you supporting? Patrick Evans Foundation – helping those suffering from any illness and disease, support those dealing with bereavement and loss, create healthy sporting opportunities for young people and promote awareness of safety in sporting activities. What inspired you? My mother was diagnosed with pancreatic cancer in January 2017 (a string of the disease which has been much less researched than others) and after going through the normal cycle of treatments was offered a pioneering treatment unavailable on the NHS and could only be done privately. She made the most human decision and paid the cost of putting her health first. Unfortunately, soon after, there was concern that the cancer had spread to her lungs and to undergo another round of the treatment would come at another high price. This is where the Patrick Evans Foundation stepped in and so generously offered to cover the second treatment, and now I want to raise the money back for them, so they can continue to give people a life after cancer. What will you be most afraid of on the day? Wow. Okay, I think I’ve got quite a lot of fears for the day! In the back of my mind is always the ‘what if I can’t finish and let everyone down?’, but I just don’t see myself giving up. I’ll crawl to the finish before that happens – but anyone at the finish might have a long wait..I’m also not the greatest shape for an ultra runner and have a lot of wear and tear in my joints from years of rugby, so am slightly concerned that my ankle specifically is going to be totally destroyed, rather than just the ‘little bit’ messed it is right now. Not being an organised race…making sure I find toilet locations is possibly one of the biggest worries too! Read more about Pete’s story here. Who are you supporting? The Anthony Nolan Foundation – every day, they match incredible individuals willing to donate their blood stem cells or bone marrow to people with blood cancer and blood disorders who desperately need life-saving transplants. What inspired you? I have a friend who has worked closely with the foundation and both she and I have been on the donor list since university. I signed up to be a donor when I was part of a campaign to find a match for the sister of a friend – however, I don’t think many of us have to look far to find someone who has needed a stem cell donation at some point. It’s so important to have as many people signed up to make it easier for those who need a transplant to find a match. Read more about Tory’s story here.